His daughter wrote in March 1992 about her father Aron: " He was born in Georgenburg (Yurburg), Lithuania. After school in Memel, he went to the University in Cologne, and then to Lille, France to study textile engineering. He returned to Lithuania and opened an enterprise. He married and had two children, a son and a daughter, Yossi and Ida." "With the beginning of WWII, because of the Nuremberg Laws, the family had to go to the ghetto in Schaulen. There his son, Yossi, age 6, was killed. His wife and daughter Ida, were deported to the concentration camp at Stutthof; when the Russians approached, they were infected with diptheria and thyphoid and died." 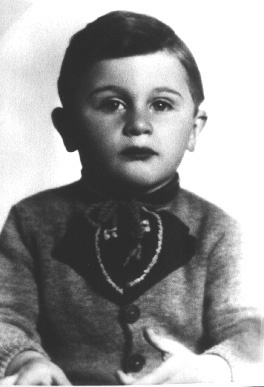 "Aron was taken to Dachau and Landsberg, where he was until 1944. Then he was sent to another camp in Bavaria. Before the Americans came to it, they were told to go to Austria. After a nine day walk they were liberated by the American troops." "After the war Aron met my mother. They founded a knitting factory in Landshut and then moved to Munich. In 1961 they moved to Pfaffenhofen, Germany."